Republican presidential hopeful Mitt Romney at Lansing Community College today. 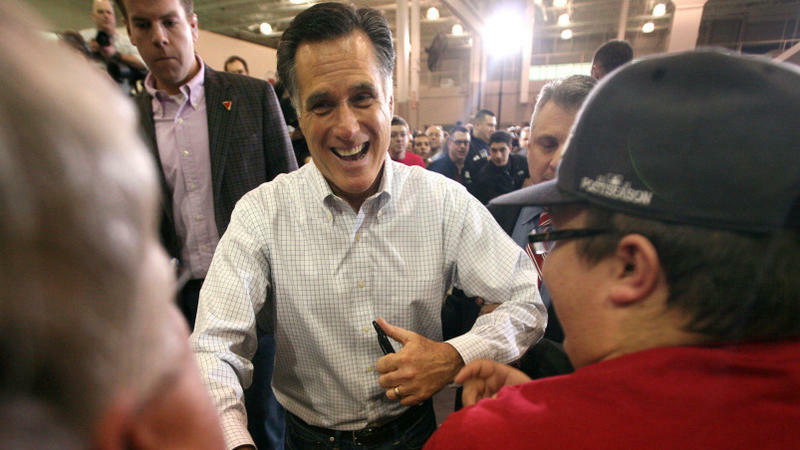 Republican presidential contender Mitt Romney gave a speech at Lansing Community College on the economy. Standing in front of a backdrop a [sic] six flags — two Michigan state flags, and four American flags, one of which bore a steel border meant to invoke manufacturing strength — Mr. Romney seemed to prefer the “New Democrat” policies of President Bill Clinton, whom he touted as counterpoint to Mr. Obama. Here's the text of Romney's speech. Romney supporter Harry Kost of Lansing says he liked the candidate’s remarks about business creation. (He’s) Gonna make it easier for businesses to start and then not be taxed to death in that. And I think he’s going to give us the chance to have more people go to work,” said Kost. Kost also agrees with Romney about ending so-called ‘Obamacare’ and building a U.S./Canada oil pipeline. Norma Jean Wiley voted for Newt Gingrich in the Michigan primary. But the Hillsdale County resident says Governor Romney is growing on her. “The more that I see of him, I can see that he has a more human, conservative side that I appreciate,” said Wiley. Lynn Taylor of Ann Arbor says she plans to follow the details of Romney policies as they take shape. For now, she is solidly behind the republican. “He promised he’d end Obamacare and that’s important to me. And he will fix it. He said he would do a partnership with the government and the private industry, so I thought that was good,” said Taylor. Taylor says she thinks Romney is committed to innovation and moving forward. In a speech in Ohio yesterday, Romney brought up his position on the auto bailouts, going so far as to take credit for the U.S. auto industry's comeback. It was a topic that The Caucus' Parker says he did not mention once in his speech today. 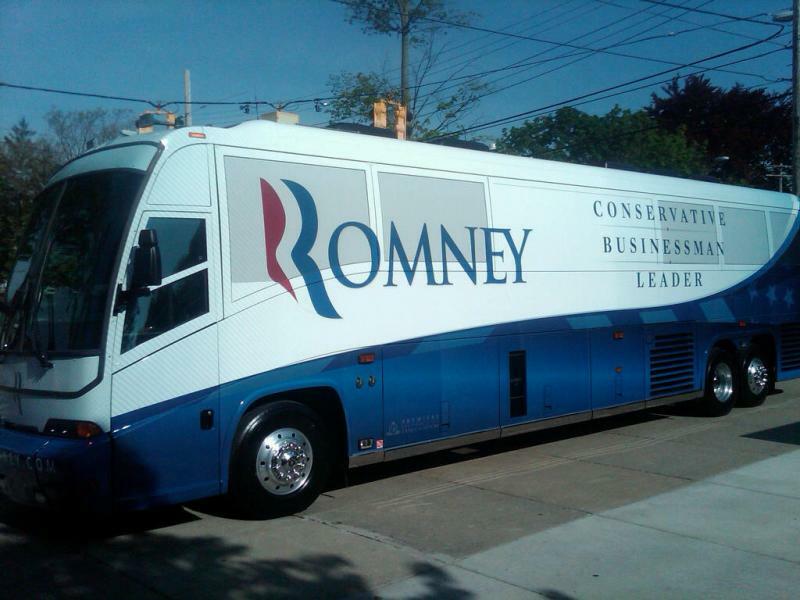 Mitt Romney's bus pulled into Michigan today as he prepares to give a policy speech this afternoon at Lansing Community College. The fact that Romney is here is a sign that the Romney camp feels Michigan is a battleground state, but as MPRN's Rick Pluta points out, a "Republican nominee has not won Michigan in 24 years." 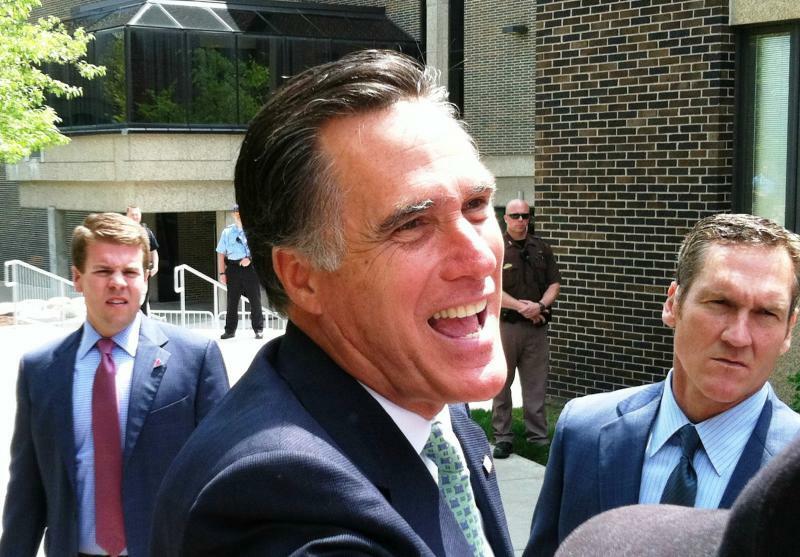 Romney is banking on his ties to the state. He was born in Michigan and his father, George Romney, served as governor in the 1960s. Now to solve a nagging problem for Romney in Michigan. In 2008, Romney wrote a New York Times op-ed piece that carried the headline "Let Detroit Go Bankrupt." Yesterday in a speech in Ohio, Romney took credit for saving the auto industry. 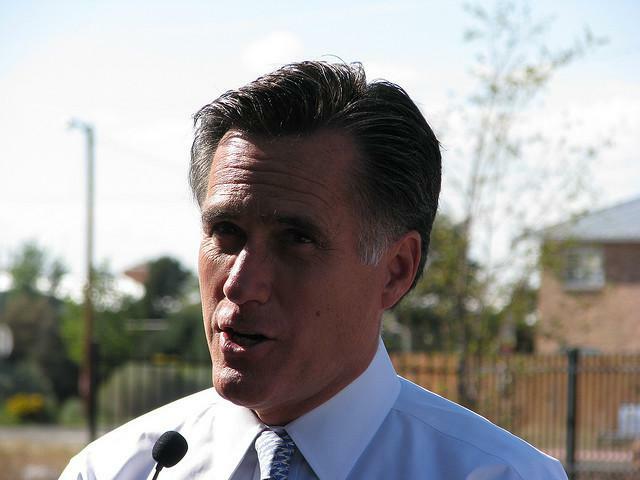 Romney has continually said that President Obama ended up taking his advice on how to manage the ailing U.S. auto industry. But the Associated Press reports that Romney took it a step further in yesterday's speech "by saying he deserves credit for its ultimate turnaround." The Detroit Free Press reports that "the bailout of the Detroit-based automobile industry is expected to be a dominant issue today." Romney got "two Pinocchio's" in a Washington Post "The Fact Checker" piece when they looked at whether he's been consistent in his stance on the auto bailout. Republican Michigan Gov. Rick Snyder has endorsed Romney. Snyder is expected to introduce him today at Lansing Community College. We'll have more on Romney's speech later today. Everything about Tuesday's campaign event in southeast Michigan's Shelby Township highlighted that Mitt Romney is a local product running for president. Songs from Motown and Bob Seger blared. A giant deep-blue Michigan state flag hung stage right. An aide passed out paczki (pronounced "punchkey"), jelly-filled Polish pastries that are a Fat Tuesday tradition in Michigan. Then came the candidate.